Would you list him as probable or questionable? How’s he looked in your eyes during practice? Did you want to divulge who is going to start at the other cornerback spot? And same with return specialist? Let me ask you this, understanding that you’re not going to say who it is–? Then let me ask you this, how long ago did you tell these guys though when they’re starting so that they can prepare for that role? You said early in the offseason that you wanted to get your team better acquainted, more comfortable with Levi’s® Stadium and that wasn’t as possible as you had hoped. Where are you on that and do you feel good about the comfort level, the home-field advantage you’re going to have? You’re a guy who wears black a lot and it looks like–? And it looks like they’re going to be giving out black t-shirts and the black uniforms. Do you think that will help with having the crowd all being the same color and the new uniforms? Would Australians have any particular reason to want to tune in on Monday Night? Back to the stadium real quick. Have you gone out and checked the field conditions in terms of–? Your kickers have been practicing there throughout the week? How would you assess the week of preparation, the practice, what you saw from the guys on the field? With former 49ers and current Oakland Raiders LB Aldon Smith signing yesterday with the Raiders a month after you guys dismissed him and you had a really compassionate plead for people to seek help. What are your thoughts about him getting back into this? I know you offered him help when you released him. Did he follow up on any of that? You’re going to have one guy on your injury report which is a very low number comparatively. Do you interpret that as a success towards your approach to injuries this year? You’ve done the thing where you wouldn’t let a guy come back until he was 100-percent, that sort of thing. I’m going to ask a Hayne-related question that’s not necessarily him. With all that’s gone on, has anybody sent you request for you to look at them? Like maybe other sports stars or any of your ex-NFL Europe products sent you? Any fan mail about what’s going on? Any cross-sport guys? But, have you gotten people that have reached out to you? Have you heard from any of your old NFL Europe cross-sport guys? LB NaVorro Bowman mentioned yesterday, potentially his first game back, obviously Monday potentially being jacked up and he’s going to have to deal with maybe trying to harness his emotions. What’s your sense been of him this week when you’ve checked in and what message is he giving off to you in terms of how he’s preparing for Monday? How has the offensive line starting to come together now that OL Jordan Devey’s set at right guard? You had padded practices last week, what Wednesday before and then Friday? How have you seen TE Vernon Davis, pretty motivated to bounce back from a tough year? We see him over on the side working with tight ends coach Tony Sparano, how has that relationship been with those two? Do you expect the Vikings to test your offensive line in different ways to make sure they’re all on the same page? You said in training camp you thought you had the right offensive linemen there but time will tell. You ended up making two trades for offensive linemen. What do you feel now? Do you feel like–? Apologies to the beat writers, a RB Jarryd Hayne question. How have you found him dealing with the attention for a player who has still got a lot to prove? Are there any management issues with you given that he’s still got a lot to prove and is getting so much attention as a rookie? Has it been a challenge for you? Did you see enough just in the last week when he was healthy for WR Bruce Ellington to be the number three guy? WR Torrey Smith seems unconcerned that they didn’t hook up on a lot of passes in the preseason, with QB Colin Kaepernick. Is that your take too? I mean, they hit a lot in practice. Are you getting along with C Nick Easton? When you guys were scouting him, did you look at him as a guard as well? Is he capable of playing that? In basketball, coaches likes to say it’s important to get a big man involved early, get him touches early. Does the same principle apply to Vernon Davis? Could you imagine how tough that was for him last year dealing with some injuries and not being utilized maybe the way he–? What kind of differences have you noticed out of RB Carlos Hyde the rookie to Carlos Hyde the number one back replacing someone like former 49ers and current Indianapolis Colts RB Frank Gore? But, was rhythm maybe an issue for him last year in the sense that he was a much different runner than Frank? What’s your assessment of QB Blaine Gabbert’s preseason performance? How do you kind of account for what you think the Vikings will do on Monday night? How hard is it to game plan going against two burners on the outside, you have Vikings WR Charles Johnson and you have Vikings WR Mike Wallace who can basically just clear out, opening the middle for Vikings TE Kyle Rudolph, so how do you, how tough is it to game plan for something like that? Have you decided on who’s going to start at cornerback and where are you in that process? It seems like those guys have different skills sets. Would it make sense to decided playing time based on matchups? WR Torrey Smith said the other day that he was surprised to find out that CB Keith Reaser and CB Kenneth Acker both had missed last year due to injury because they were both so good and so polished when he arrived. Did you have the same reaction that they didn’t really seem like guys who are feeling their way along this offseason that they just kind of jumped into it with two feet? How has LB Ahmad Brooks looked after being away for a week? You would expect no restrictions on him, he can play? Did you see him take some, you know, new approaches to his fitness, to his eating or did he share any of that with you over what he did during the offseason? Is there any, was there any awkwardness there with Ahmad being gone for that time and then being welcomed back? Because he was kind of in limbo for a while, how did you kind of plan for that in that time? One of those big changes was former 49ers and current Oakland Raiders LB Aldon Smith. Obviously, you only had him for this offseason, but today he signed with the raiders up the freeway here a little bit. Any reaction to him getting on with his career? Can you talk about how you see LB NaVorro Bowman approaching this game and whether this has kind of played up to a dream scenario for you, just he’s come in all the way through this healthy and is ready to go Week 1? He’s such a key figure, not necessarily on the defense but on the team, do you sense or do you notice other players sort of reacting, when he makes a play does it kind of lift up the rest of his, the guys around him? The Vikings offensive line, obviously, has a few moving parts, more so than you would usually, do you try to test them to make sure they are all on the same page? In the preseason, we saw Jaquiski working in maybe playing some linebacker in some certain sub-packages. How much of a luxury is that to have a guy who physically can probably fill in the run game but also has the speed maybe to cover some players in the modern NFL? Pittsburgh Steelers head coach Mike Tomlin said the Steelers coaches’ headsets weren’t working properly last night in New England and that sort of thing happens a lot there. You coached there and against them, any comment? Fans seem concerned about your offensive line. Obviously, you guys haven’t, you know, the starting five hasn’t taken a ton of snaps in a game situation together. How concerned are you as far as cohesion and how ready they might be? When you talk about cohesion, I feel like you are going to do a little bit more zone blocking. Do you want guys who maybe aren’t as talented but can play more together to get that thing going? Minnesota Vikings head coach Mike Zimmer said this morning, he complimented LB NaVorro Bowman for the way he’s come back. He hopes Minnesota Vikings RB Adrian Peterson comes back in a similar way to what Bowman has done. What’s your take on Peterson and defending him and playing? There’s some anticipation for him coming back. Sorry to ask again about RB Jarryd Hayne. You’ve obviously got training over the next few days. What do you want see out of him? What are you specifically looking for to ensure or to better his chances of getting a go on Monday night? And when you say those, for people in Australia who don’t understand the game, when you say those fundamentals, can explain what you mean by that? I assume you’ve got the game plan sort of in. How much have you thought about what the first offensive play call is going to be? And I’m curious about as the game goes on, obviously, that’s offensive coordinator Geep Chryst’s area. How much do you see yourself getting involved on a play-by-play basis? As the game is progressing, how involved will you be in the play calls, offensively and defensively? Well, what did you learn your previous time as a head coach? You’ve done this before. What’d you learn from that that will help you here in terms of that, the play-by-play? In light of what you’ve just said about Hayne, how much confidence do you have in him right now that he can field punts efficiently? In a game on Monday night or even late in the game if it comes to that? WR Bruce Ellington’s hamstrings are fully healthy? You mentioned after the Chargers game you wanted to get back on the practice field those two days last week. What was the goal of those two practices? Was it more for game planning or was there still some fundamental things you wanted to work out? WR Torrey Smith talked about how he and QB Colin Kaepernick were practicing well these couple days. Can you just, looking at the league overall, it’s such a quarterback-driven league and a lot of eyes are on Colin. Does he need to play at a league MVP level for this offense to succeed? But, he seems driven to prove everybody. What did you learn about the Vikings organization from that time you spent with them in Charlotte? Was there, when you, I don’t know how much research you had done into their organization, but are there any things that now you can apply about how that roster was built and–? How flattering was that, for them, for an outside organization, you’ve only been with one NFL organization, for someone from the outside to think enough of you to bring you in for that kind of opportunity? Are you guys using the virtual reality this week? Is it just from a quarterback perspective or do you have other–? That was the one developed by Stanford, correct? What’s your assessment of Vikings QB Teddy Bridgewater? How good were you at video games? Mike Zimmer, obviously, is a defensive guy. 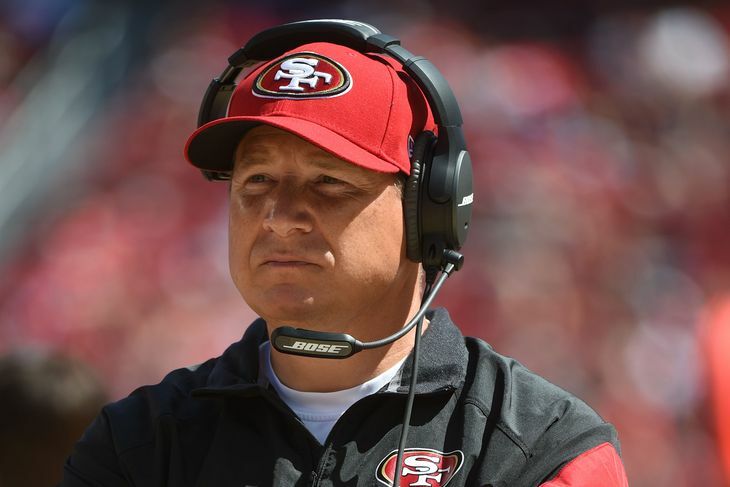 As far as stunts and things he did when he was a defensive coordinator, is there anything you’ve noticed through the years that may be unique or special to him and will you be expecting some of that Monday? Special Teams Coordinator Thomas McGaughey Jr.
Who’s going to be your return man on Monday night? Does that make the decision harder though, that you now have three guys who can do it? What are the primary factors that you’re considering right now when picking a candidate? You realize Australians will declare a war if RB Jarryd Hayne doesn’t get in the game? Speaking of experience, 49ers head coach Jim Tomsula talked about you have to do more than just being a punt returner. What do you see Jarryd Hayne’s progress in terms of taking proper angles when he’s on kickoff units and punt returns and so forth? He lined up in the middle on the kickoff coverage. This is maybe just a general question. How do you decide where to put somebody on kickoff coverage across that line? WR Bruce Ellington, I think, is the only guy who returned punts last year and maybe the only guy who, other than RB Reggie Bush who’s ever done it. When you look at Reggie who looked a little rusty in the game at Denver, WR DeAndrew White and Jarryd, how much do you have to really hone in on just decision making when you’re back there? I have a question along those lines. I believe it was the second preseason game where Jarryd made an over-the-shoulder fingertip catch. Is that something that you want to see or in that kind of situation is it best for the guy just to let it go? So you need, he needs to prove to you that he can make that catch, which he’s done? Could we see different punt returners based on field position as the game progresses? How much is, you know the three guys you’ve mentioned returning the kicks all did very well. How much is that to do with how well it was blocked up? What’s your assessment of DeAndrew White as a returner? Last time we talked, you said you needed to see more from WR Bruce Ellington, he hadn’t been on the field enough. Now that he’s been on the field, what’s your assessment of Bruce? Coach Tomsula actually said he sat him down, maybe you were there, and talked to Bruce and said this is what you need to do before practice, after practice, healing, recovery. Have you seen a big difference in him since those two chatted and just taking more responsibility for that? Since coming back from his foot injury or back into practice, how much has DB Jimmie Ward played on special teams and do you expect him to be an option on Monday? Has he been a gunner primarily? And WR DeAndrew as a gunner? It looked like he did some stuff pretty early in camp. How has he progressed in that area? It seems like there’s a very real prospect that Jarryd might play on Monday night, would you say that? You guys seem to be downplaying it. But I mean, can you take some of his skills, what he has, and translate that and get your guys to look at what he’s doing? Have you seen that? Are we going to see any lateral passes? Your special teams guys have got to play a scrimmage position too. When you’re making a choice about who to be active or not, how much does that play into it and who makes the final call? In terms of making a decision in a given game? Does it sometimes have to do with the game plan? You’ve obviously switched modes from the preseason to the regular season now, but in terms of your mindset, where are you at going into this? You’ve had six months of preparation now. Where has this team gotten in the six months to convince you of that? You guys obviously kept stuff in reserve, a lot of stuff in reserve during the preseason. Would you say you kept more hidden than in previous years or is this just typical as far as what you showed during the preseason? In June, you talked about cleaning a lot of things up and you wanted to take on a greater load to carry this team. Where do you feel like you’ve come from, you know, in a matter of those three months since mini-camp? It’s a team game, obviously, but personally, you’re 4-0 on Monday Night Football. You’ve got nine touchdown passes, no interceptions. What is it about the lights of Monday Night Football that kind of makes you ramp up the game? And I know, also, you’re looking forward to a new start, new beginning. But also, looking back a little bit, what’s the biggest lesson you took from Jim Harbaugh? How do you think the offense has adapted in camp and the preseason as far as the faster tempo that you guys are trying to implement? You don’t seem like a guy that’s really worried about outside perception given everything that’s happened this offseason. As a team captain, how do you relay that message to block out all that outside noise to the rest of your teammates? How eager are you to see TE Vernon Davis turn the page? I’m sure all of you turned the page on last year, but he especially wants to get things started in a positive direction. Head coach Jim Tomsula was saying he wants ‘Colin to be Colin.’ How do you be yourself in this league? What do you want people to say about what kind of quarterback you are? A couple years ago, you had the dual-threat. You took pride in being a dual-threat. Is that something you want people to take notice of again? What sticks out to you about Minnesota Vikings head coach Mike Zimmer’s defense. What are you looking out for? Are any blitzes unusual or a lot or is that something you have to prepare for in particular, the blitzes? Have you found the virtual reality to be valuable in preparing for opponents? How much are you using it this week, for example? 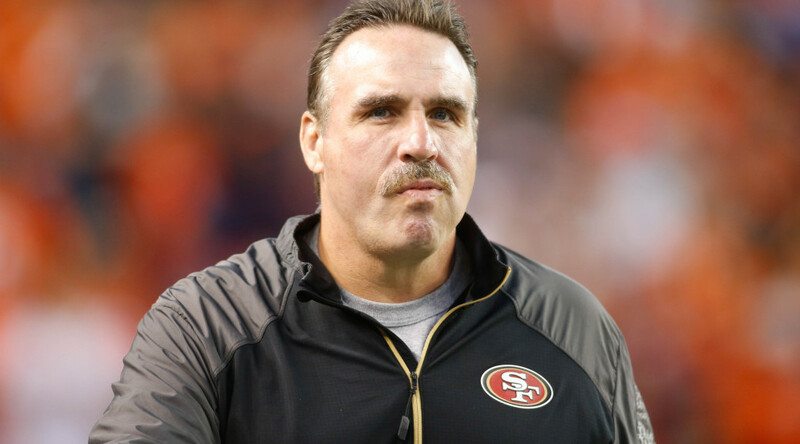 Will it be special to see coach Tomsula? It’s his first real game as head coach and you know how far he’s come to do this.